The former Trump Taj Mahal is soon to be reborn as the Hard Rock Hotel and Casino Atlantic City. This rebirth looks set to be a total transformation of the venue, not just physically but also in respects of the site’s relationship with its employees. After Donald Trump purchased the billion dollar property, he unceremoniously sold it to Carl Icahn, the billionaire businessman who eventually sold it to Hard Rock for $50 million. What many believe prompted the budget sale was due to difficulties Icahn had with local labour unions. The casino staff eventually staged protests over extreme expenditure cuts at the venue which would have meant staff would lose all their benefits like health insurance and pension funds. Icahn was, for lack of a better word, run out of town and now the new owners, Hard Rock, have pledged to work with the local union, Local 54 which includes various members formerly employed at the Taj Mahal. When the original venue closed down in 2016 thanks to Icahn’s greed, a reported 3000 people were left in the lurch. At the moment the union Local 54 only has around 1000 members but the group has been picketing hard to get its name known across Atlantic City. There are caveats from Hard Rock however in this case. They wish to have a Card Counting session to officially find out how many members Local 54 actually have before they will fully come to the negotiation table. They have already said that they will fully recognise Local 54 as the primary contact between hard rock and their employees, should Local 54’s membership numbers life up to their claims. In addition all Local 54 members previously employed at the Taj Mahal will be able to get their jobs back if the return to the new Hard Rock Casino. Both parties so far have praised the talks, with Hard Rock outright saying that dealing with a union would make their entry into Atlantic City that much more simple and rewarding. Hard Rock have been very busy beavers of late with a few land based expansion plans in the pipeline. 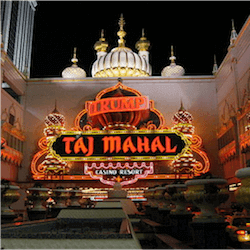 Many gamblers are looking forward to seeing the iconic Hard Rock features replacing the Indian themed Taj Mahal, which has recently become an unwanted symbol in Atlantic City. With so many changes coming to the casino market as online gaming encroaches on more and more on land based territory, some renovations and reinvigoration is very welcome in Atlantic City.